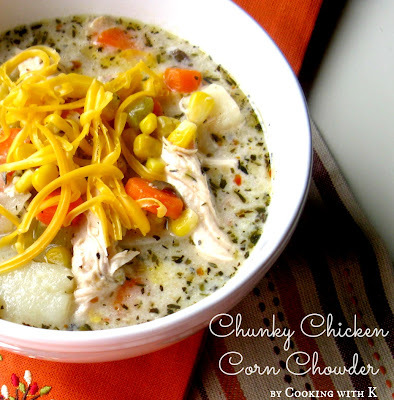 Chunky Chicken Corn Chowder, rich corn chowder built on a base of chicken stock and half-and-half has carrots, corn, potatoes, and chunks of chicken for a meal in a bowl. Listening to the weather report the night before, I knew we were going to wake up to a winter wonderland. My first thoughts were, I can make some homemade bread and this new recipe for chowder that I have been wanting to try. This chowder is not only a delicious and filling chowder, it is just what you need on a cold wintry day. Despite the long list of ingredients, it does come together rather quickly if you peel and chop all your vegetables, and have them ready with all the remaining ingredients while you boil your chicken. You have a perfect balance of the chicken, the creamy cheese, and the tenderness of the corn to best describe this recipe as "one big pot of extravaganza"! Wash chicken thoroughly, inside and out, under cold running water. Drain well. Place chicken in a large stock pot; add water, salt, and Montreal Steak Seasoning, making sure the water is 2-inches above the chicken. Bring to a boil; reduce heat; simmer 1 1/2 hours or until chicken is done with meat coming off the bone easily. Remove chicken from broth and set aside to cool to the touch. Add the remaining ingredients to the chicken broth except the cheese. Bring to a boil and simmer on medium heat. While the vegetables are cooking, remove the meat from bones discarding the skin and cartilage. Cut up the chicken in chunky bite size pieces and add to the vegetables and stir. Add the cheese and stir occasionally to make sure the cheese does not scorch on the bottom before melting. If the liquid evaporates to much add a little more homemade or canned chicken broth. Before serving remove bay leaves. 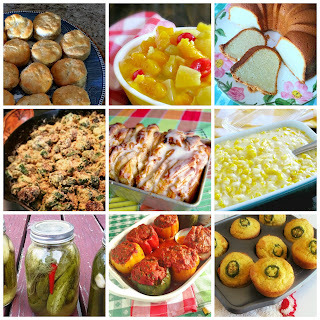 Join me for Freedonm Fridays, Link Party Palooza, Weekend Potluck and all these fabulous parties! This look so good to me! 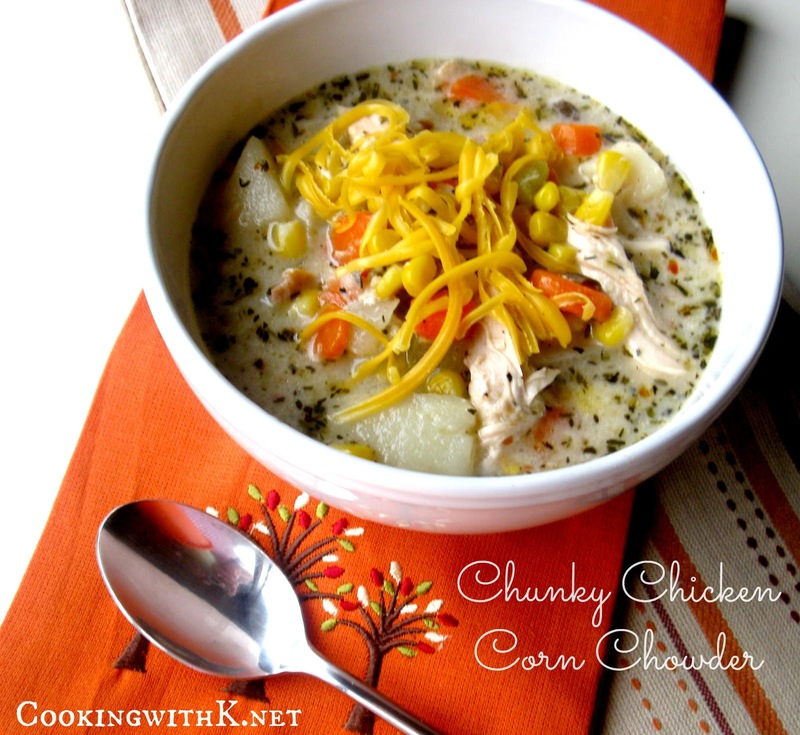 I love chunky soups like this. Another soup/chowder to add to my ever-growing list of soups to try. It looks delicious! Oooooh, this does sound rich and thick. 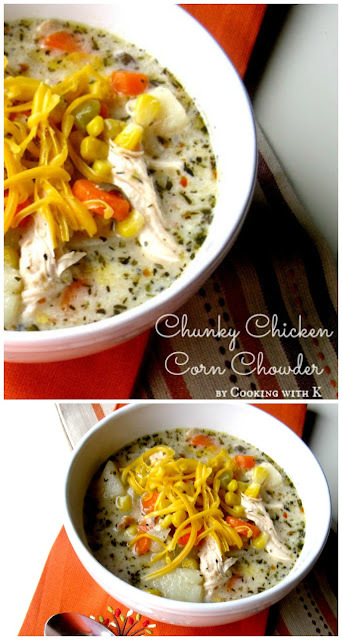 I love corn chowder, have only recently tried chicken corn chowder. 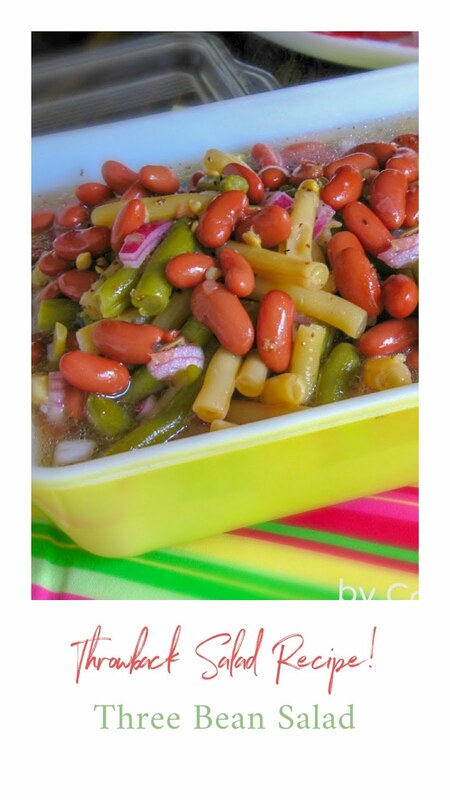 This recipe sounds amazing. 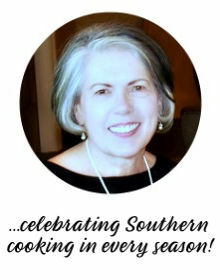 Thank you for sharing such a lovely recipe.